For a long time, I had thought that the tall birch tree between Hamfelde and Basthorst, two villages near Hamburg, would be a good a motif for me. With its lively branches dancing in the wind, this tree drew my attention whenever I passed it. On a nice day in May I painted it and then visited my friend Ute in Reinbek. Like in old student days in Berlin, prints by Gauguin, van Gogh and Paula Modersohn-Becker adorn her walls today. She loves art, literature and France as I love painting, writing and traveling through the world. “Don’t you want to show me your new painting?" Ute asked whilst we sat at the beautifully laid table in her garden. Looking at my sketch book, her eyes glowed in a familiar way: “Ah yes, you always liked trees! I can remember exactly the big palm that you painted in our shared flat next to your tiled stove – from the floor to the ceiling.” – Flashback! There it was again in front of me, my old room with the palm, the large bay windows, my hammock across the room, the many green plants, my two zebra finches, the antique desk and a certain postcard on the wall above it. “Yes, I remember – and now, finally, I know why I painted this birch tree!” – Ute looked at me in surprise. “You still know my uncle Ernst, don’t you?” I began. “He taught me a vagabond song, when I was 6 or 7 years old, which I have never forgotten. And do you remember the postcard on my wall at that time, the one with the two old men under a birch tree? I bought it for myself in my first semester at university because it reminded me of this song. 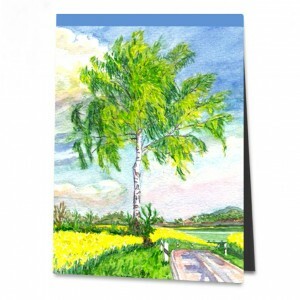 Yes, and when I painted this birch now, it is definitely a throwback to the postcard from way back then. A subconscious chain of association, so to speak!” Ute’s cheeks revealed a dimple from the left and right. “You cannot be serious,” she laughed. “You've just made that up.” I shrugged, put on an ‘everything-is-possible’ look – and then gave in. “Yes, I think you’re right,” I said, “but it’s somehow musical, my birch tree.” And then I spontaneously sang my uncle’s unforgotten song to her.